A Bell UH-1 (Huey/Iroquois) Rotor Blade Plaque with 2 optional engraved images. Click to enlarge. A few blades. Click to enlarge. A sample photo engraving. Click for more. 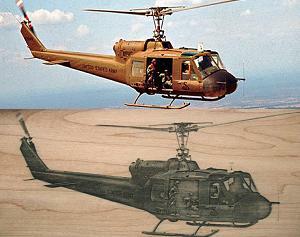 The illustrator who runs the Vietnam Huey Illustrations web site is creating personalized images of Hueys and other helicopters. If you're considering a plaque with an image, consider one of those!